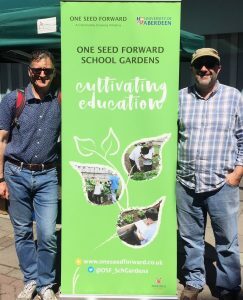 The Garden Schools initiative is a collaboration between the voluntary organisation One Seed Forward and the School of Education in the University of Aberdeen. The overall aim of the project is to involve schools in being active participants in creating a physical garden space in their school that can be used to educate children in the benefits of growing their own food. One result of the pilot project, apart from the development of the gardens in each of the schools, was the creation of an educational programme and materials which can now be rolled out to other schools. The programme and materials are now freely available for everyone to use – see our page Education Materials to download a copy. • The creation of, or improvement to, a space in the school that can be used as a vegetable garden. • A developed school educational programme that includes local vegetable growing, health and nutrition benefits, recycling and composting, links to literacy, numeracy, citizenship, science and arts. • Developing links from garden projects to raise awareness of climate change and climate actions and sustainability.